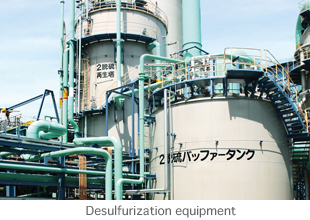 Environmental Protection｜Sumitomo Chemical Engineering Co., Ltd.
SCEC seeks to ensure a good global environ- ment for the coming generations as the world begins to address these difficult problems. SCEC's engagement in environmental pre- servation dates back about 100 years to the removal of sulfur dioxide from copper refining waste gas and recovering it as a resource, and this led to the production technology of sulfuric acid and fertilizers. Based on the valuable technology SCEC has received from its predecessors, it has accumulated a vast amount of plant engineering experience related to the removal of environment polluting toxic materials such as SOx and NOx (sulfur oxides and nitrogen oxides) over a period of 50 years. Today, industrial facilities are required not only to remove toxic materials but also to curb the emission of greenhouse gases such as carbon dioxide. In all activities from plant planning and design to construction SCEC places major emphasis on pro- tecting the environment. SCEC is committed to pursuing the path of environment friendly engineering.